It’s no secret that most utility expenses come from heating and cooling. Upgrading your HVAC unit helps, but the real culprit for power consumption is you. Google’s Nest Thermostat reduces your energy usage, but it’s expensive. Is Nest worth it in the long run? Let’s find out some of the Nest pros and cons. 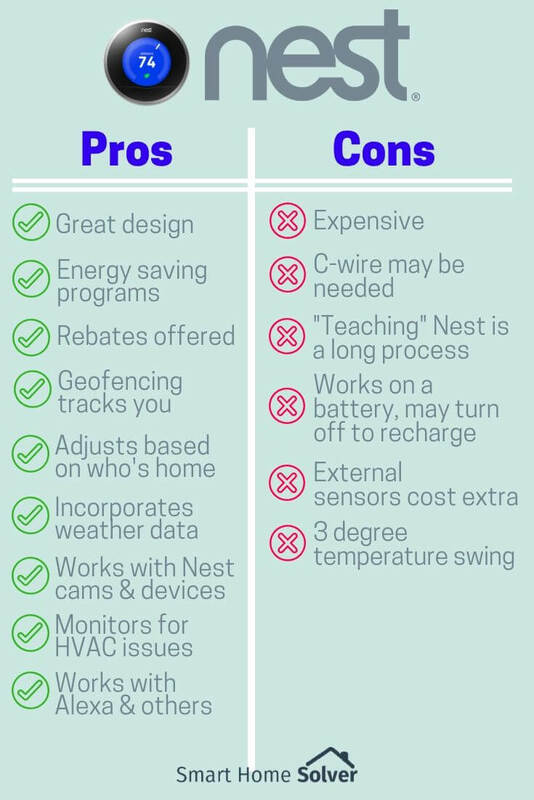 We break down each of the Nest pros and cons in our list below. 1 Is Nest Worth It? Affiliate Disclosure: This page contains affiliate links, which earn us commission at no cost to you. The writers of this blog received a free sample of the Nest 3rd Gen for review. They were not compensated in any other way. The opinions are 100% their own and not influenced. 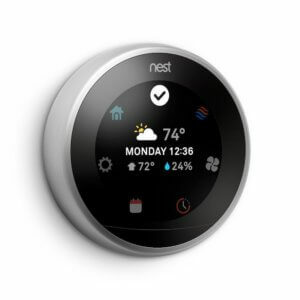 As listed above, there are plenty of pros and cons for the Nest thermostat. Below you’ll find details about why it is and is not worth it, along with our experience with Nest 3rd gen.
It’s beautiful. There’s nothing wrong with looking good while performing a task. Nest’s 3rd generation device showcases 229 vibrant pixels of digital mastery. The colors pop. And thanks to the latest Farsight enhancement, after the display spots you from across the room, it will illuminate the set temperature, latest weather conditions, or even an analog clock. Easy controls. There are no buttons. Instead, the device is encased by an active ring (available in black, silver, white, or copper) that you turn to adjust the settings. 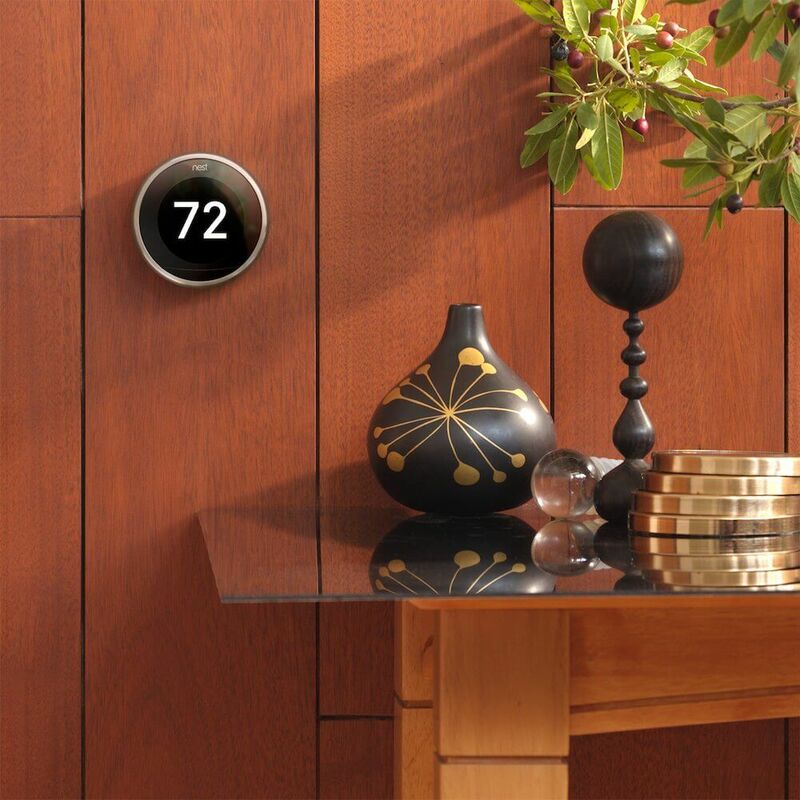 It’s easily the most impressive-looking smart thermostat out there. It pays for itself. Many people researching “is Nest worth it?” are wondering if its energy savings are worthwhile. Nest’s comprehensive white paper found that users saved between 10-15% on their heating and cooling bills, or around $131 to $145 per year. In just a few years, it literally pays for itself in energy savings. Nest’s helpful energy calculator estimates how much you can save per year based on your location, square footage, and a few details about your HVAC. Additional rebates and programs. You can also get a rebate if your county offers them, or integrate Nest’s Rush Hour Rewards software to use less energy during peak hours. The Rush Hour Rewards program is unique for Nest and makes it easy to save during peak hours. Since Nest is such a widely known brand, it offers you the best chance of getting a rebate. It’s “sensorific.” Sure, the device is barely 3.3 inches around and 1.2 inches thick, but Nest engineers stack sensors upon sensors in the tiny computer. It includes 10 sensors just for temperature, in addition to sensors for humidity, weather, and motion. Nest even includes an ambient light detector to dim the display output when the room is dark. Nest is so smart, it detects if sunlight is beaming directly on the thermostat and falsely raising its temperature, an error which frequently confuses basic thermostats. Geofencing capability. This is a big perk when looking at the Nest pros and cons. It creates a digital fence around your home to automatically use less energy when you’re away. When you download the Nest app, the unit syncs with the app to follow your phone’s location; they call it Home/Away Assist. Nest verifies that you’re really not home by pinging the location of your phone before determining if it should be in away mode. It learns your ways. 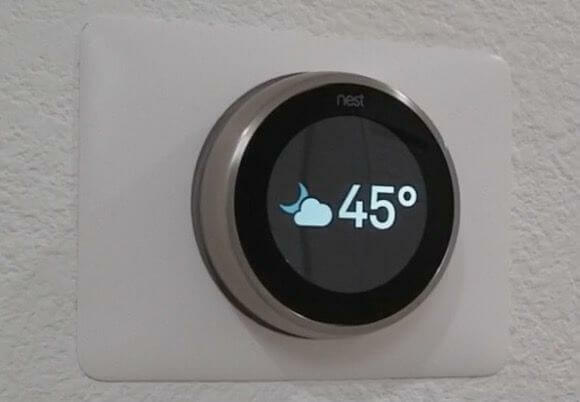 Nest 3rd generation contains both short and long-range sensors. These sensors (combined with the geofencing) pick up your habits for the first week the thermostat is installed, by learning your whereabouts and preferred temperature. 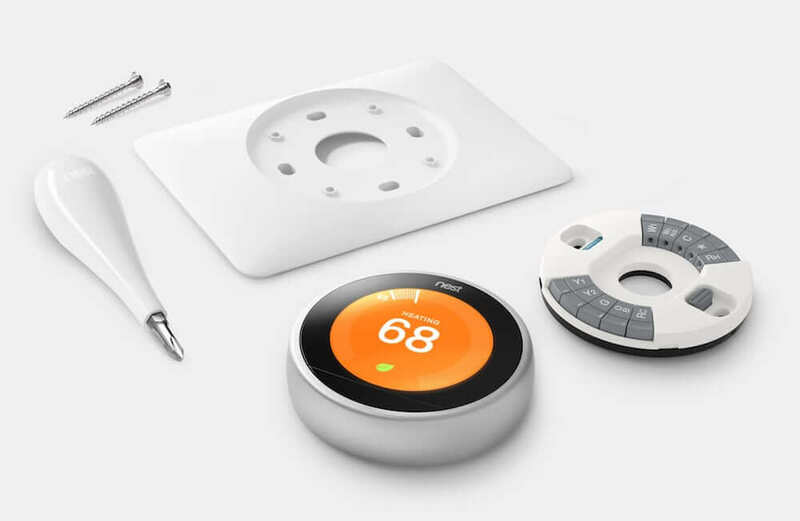 Nest then creates a schedule that caters to your household temperature preferences. This is a big improvement on the previous versions of Nest, which utilized short-range sensors to detect when people were home or away, but frequently switched to “away” just because no one had walked in front of the thermostat for awhile. It allows for multiple users. Nest 3rd generation offers Family Accounts. Since everyone has different temperature preferences, it can adjust itself based on who is home. There doesn’t seem to be any limit to the number of accounts that can be sustained by each Nest. It’s like having a personal meteorologist. Ok, it doesn’t predict the weather, but it certainly monitors it, which is very useful for maintaining a comfortable indoor environment. Based on current and forecasted weather conditions, the algorithms of the Nest combat the heat and the cold with preemptive temperature adjustments. Control it from anywhere. 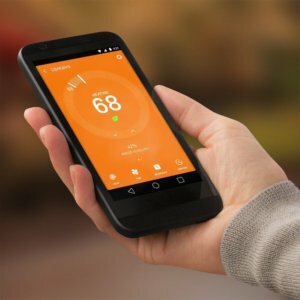 Using the Nest app on a smartphone, you can control your HVAC system from anywhere in the world. Nest is very smart home compatible. 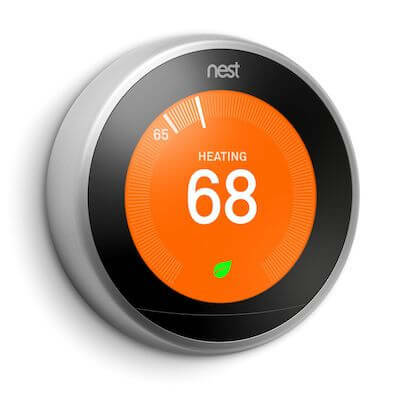 Nest thermostat is compatible with many other devices including Alexa, Google Assistant, Philips Hue bulbs, IFTTT, smart appliances, smart watches, and more. What makes the app unique among smart thermostats is that you can use the same app to adjust all Nest devices, including Nest security cameras, doorbell, security system, and more. It can grow to become a complete smart home solution so you don’t need to download multiple apps. You can also automate your thermostat and security cameras together, so that when you leave, the thermostat adjusts and security cameras arm all at once. It studies your home. Nest Sense is like having a live-in HVAC butler. It monitors how quickly or inefficiently your system heats and cools and then improves efficiency when it turns on. This comes in handy on many levels. If you like to wake up to a warm house, Nest knows when to begin the heating process before you arise. This is especially effective for radiant heating systems, or homes with unstable humidity patterns. It learns when running only the fan is necessary instead of running the entire unit. Nest also offers Heads-Up monitoring that will alert you of furnace issues before they become major headaches. If you’re wondering “is nest worth it,” the smart thermostat might be worth it just for this monitoring since it’s not offered on all smart thermostats. It’s not cheap. The Nest Thermostat is one of the most expensive on the market. Other smart thermostats can be $100 to $150 cheaper than Nest, which makes price one of the biggest negatives when going through Nest pros and cons. If budget is paramount and the Nest overshoots your target, here’s a comparison of smart thermostats to consider. While its price is high, the device does offer strong design and robust features, so some may consider it worth the cost. Nest’s new Nest E thermostat is an amazing option for those on a budget, since it offers many of the same features at a lower price. We compare Nest vs Nest E to help you see the differences, but the main sacrifices for this budget option are no Farsight, lower resolution display, a plastic ring, and a more basic look. The Ecobee4 is also the same price as Nest 3rd gen and has Alexa built-in, so you can ask Alexa to turn on the lights while walking past your thermostat. This is an impressive feature for a competitive thermostat priced the same as Nest is hard to ignore. The unit may require a C-wire. The dreaded C-wire is also known as the common wire. It’s required by many high-tech thermostats to supply power. Although Nest contains an internal, rechargeable battery that is sufficient for the majority of homes, its power consumption is too demanding to rely solely on the battery for specific HVAC systems. This requires a C-wire, and if one isn’t there it will need to be professionally installed. To find out if you will need a C-wire for setting up Nest at your home, check out details on Nest’s website. It needs tweaking. Although there are thousands of positive reviews raving about the quality and efficiency of Nest, there are also negative reviews citing reliability issues. Some customers warn that their units would inexplicably switch between Away, Home, or Stay modes, leaving them freezing or sweating during the night. Even when it’s working correctly, you need to teach Nest your schedule as you turn it up and down for the first week or two. This annoyance has caused some users to purchase competitors like Ecobee or Honeywell. It works on a battery. It automatically recharges while plugged into the wall, but if this doesn’t work as planned due to a power outage or wiring issues, then your battery dies. Having Nest out of commission on the hottest day of the year and going without AC for a few hours is no one’s idea of a fun summer day. It doesn’t include external sensors. Competing smart thermostats like the Ecobee3 include an external sensor that you can install in different areas of your home. Nest recently added an external temperature sensor, but it will cost you a little extra (they are typically around $40 each). The purpose of the sensor is to helps the thermostat track your movement to know when to turn on and off, and also sense the temperature in other rooms to adjust itself so that some rooms aren’t too cold or hot. Is Nest worth it without the sensors included? You decide. It has a 3 degree temperature swing. When you set a thermostat, it typically cools or heats your home within a few degrees of your target. Nest’s temperature swing is 3 degrees (compared to other thermostat’s 1 degree swing). So when you set your thermostat to 70, your home may actually be 67 or even 73 degrees. If you want your temperature to be very precise, then this is a bad thing. However, some people prefer the higher temperature swings because it can lower your bill. While you might think that turning off your air saves you energy, in some cases, powering up your HVAC again can cost you even more. Nest’s 3 degree swing allows you to blast the air within a certain range, watch the temperature to drop, and then blast it again, for more efficient use. Our situation with our Nest 3rd gen is unique, since we received it free for testing purposes. While this doesn’t sway our honest opinion in recognizing the Nest pros and cons, it still calls into question if we would have bought the thermostat with our own wallet. We’ve used Nest for almost a year now and had very few headaches. Since we are on a Time of Use energy plan, we have Nest on a schedule so that it pre-cools our home at 2pm and then turns up the temperature from 3-6pm. This has helped us save on our energy bills without the headaches of remembering to manually adjust the thermostat everyday. There was one time our power went out and the Nest didn’t follow the daily schedule, so we had to do some troubleshooting to get it working again. There haven’t been any issues with the battery dying or needing external sensors, though our home is small. With the release of Nest E, if I was purchasing my first Nest thermostat today, I’d definitely consider either Nest E or Ecobee3 Lite as a few more affordable options that still offer excellent apps and smart home connectivity. Nest 3rd gen looks nice on our wall. We have it hooked up with several smart home devices and have also tested it alongside the Nest x Yale lock and Nest Cams. I even recommended a Nest thermostat and Nest x Yale lock to my parents since they were setting up new smart home tech and wanted everything to work within one app and be very simple. 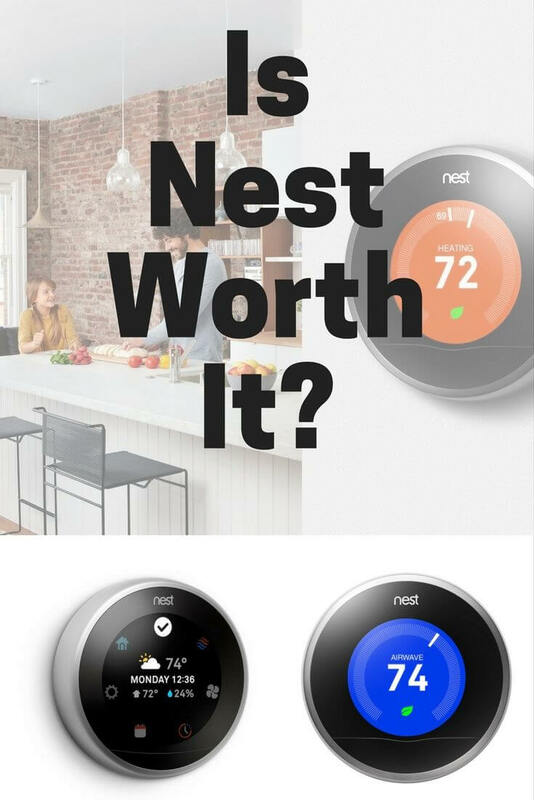 So is Nest worth it? Nest aims to balance your usage and reduce your power bill, while making life more convenient. Backed by Google, it’s super secure, looks amazing on the wall, and is the most connected smart thermostat since it works with so many other devices. Nest’s robust programs for rebates and energy reduction make it a great pick for your home since it will pay for itself in just a few short years. It has its pros and cons, so make sure you compare it with Sensi, Ecobee, and other competitors before committing. In the end, there’s no question that Nest is one of the best options out there. What do you think: is Nest worth it? Let us know in the comments below! Hey Chad. It actually does show the current temperature. The default setting will show you the target temp and the current temp. But you can tweak it to show you the current temp when the Nest “sees” you. It’s a feature called Farsight. Also the Nest can recharge it’s internal battery using the heating and cooling wires. I don’t know any other smart thermostats that can do that. So the C wire is not absolutely necessary. Just wanted to put it out there.